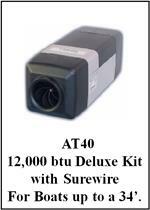 Marine Heaters - First Mate Marine Inc. Here you'll find extensive product information on our great line of marine heaters. 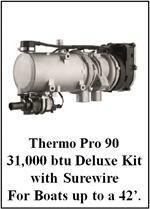 Click on the pictures below for suggested part lists and pricing of First Mate Marine's deluxe heater kits. 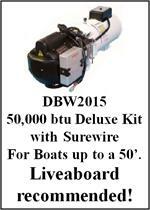 These kit lists are for information purposes to show what parts most boats will need and how much it would cost. The parts may be ordered individually. Call or email and First Mate Marine will put together the order. Why Webasto? Webasto is a global market leader in the auxillary heater industry and is a supplier to major equipment manufacturers around the world. 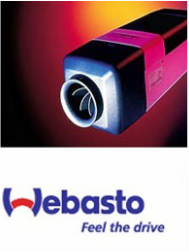 Webasto makes a full line of air and coolant heaters to meet the needs of virtually any size craft. State of the art and micro-processor controlled, all Webasto marine heaters are compact, lightweight, and efficient. 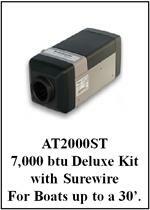 All Webasto heaters come with a 2 year warranty!! Small in size but not in power, Webasto air heaters generate warm, dry air quickly and quietly. Adaptable for installation wherever room allows, the Webasto air heaters draw fresh air into a sealed heat exchanger where it is heated very quickly. Powerful fans circulate the warmth evenly throughout any number of outlets, while exhaust is discharged outside. 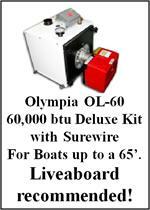 ​Nothing extends the boating season like a Webasto coolant heater. Sophisticated and powerful enough to heat a yacht, Webasto water heaters are still small enough to fit into snug spaces. Webasto coolant heaters can warm radiators in all the cabins, or be installed with fan-assisted heat exchangers when space is at a premium. The unit can even be linked to the engine's coolant system, to pre-heat the engine and eliminate cold starts. With a Webasto heater on board, you'll also have plenty of hot water for showers and the galley heated by an indirect coil in the hot water tank. 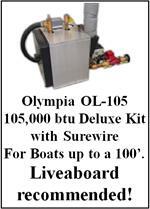 Olympia boilers are perfect for larger yachts. Designed to run off an inverter these diesel boilers put out a ton of heat. 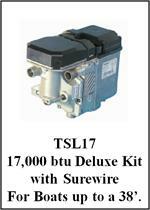 Tie it in with your domestic water system and engine for a complete heating solution. Best of all, you won't be bothered by the drone of a noisy generator. Mounted in the engine room near the batteries and fuel tank, an Olympia hydronic boiler is almost inaudible. Considering these issues, choosing the right heater is obviously very important. First Mate MArine offers a basic quick reference chart to guide an installer in the right direction. 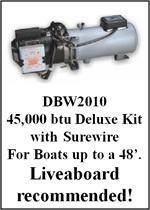 If there is concern about whether or not a heater is right for a boat, there are formulas that can be used to figure out the requirements. The internal volume (cubic feet) of the spaces being heated should be multiplied by 12 for a sailboat ((length x width x height) x 12), and by 15 for a powerboat ((length x width x height) x 15). These numbers will give a round number of the BTU requirements, but other factors must be taken into consideration. When considering a heater, the construction of the boat must be considered as well as its size. Windows are sources of heat loss that need to be considered. If a main saloon has multiple windows the amount of heat for that space should be raised. Whether or not a boat is insulated is another factor. 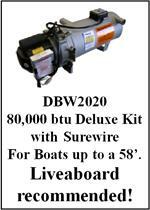 If your boat is not well insulated you should raise the heating requirements. Be sure to consider these variables if a boat size rests between heater sizing specifications. We have included tables to assist you in your sizing decision.